You can help our organizing by purchasing our postcards. Jullay, asalaam aleikum, namaste and welcome to the Zanskar Ski School - the first cross-country ski school in the Himalaya! 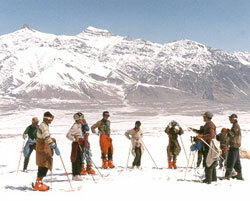 The Zanskar Ski School is a small non-profit organization in the Indian Himalaya. We provide ski equipment and ski instruction to the Zanskari people. Zanskar is a remote, ancient kingdom in the northwest Indian Himalaya. About 10,000 Zanskari people live in isolated villages spread across Zanskar, which has a valley elevation of over 3500m. Winter temperatures of -30 Celsius are common, making it one of the highest and coldest inhabited places in the world. As snow covers the high mountain passes, the villages in Zanskar are cut off from the rest of the region for 7 months of the year. Communication between the villages is also difficult due to deep snow. Skiing has never developed, as there is limited material to create skis. Large trees cannot survive in this harsh climate. With its remote economy, purchasing skis in Zanskar has not been possible. To provide communication, transportation, rescue and job opportunities for the people of the Zanskar Himalaya through skiing. We welcome you to explore our website to find out more about Zanskar, our organization, the ski school, and how you can contribute to our exciting and fun project.